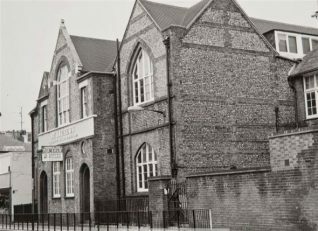 I went to St Andrews School in George Street. The teachers I remember particularly were Mr Leany and Miss Bowyer, both of whom I remember with affection. Mr Whiting was a great headmaster although I was not as fond of his successor Mr Evans. I remember him taking great delight in afflicting country dancing on us all. I remember as we had no sports field we were taken to the graveyard next door to run amongst the tombstones. I remember appearing in a nativity play at the church; I was Herod. What I do remember with no affection whatsoever were the outside toilets. Great fun on a freezing snowy day and quite dangerous when the moisture on the floors froze. Other friends and fellow pupils I remember are Brenda Grubb, Brian Smeed, Anthony Bloom and Michael Coombes. I was saddened to hear that the school closed as I was a third generation pupil. I also recall a trip to London and St Paul’s. I remember the crypt and Nelson’s and Wellington’s tombs. I also recall a trip to Hastings and I was very fond after school, of visiting Hove Museum. I also remember a pupil whose name I can’t remember but whose father was a butcher having a terrible accident at their shop and losing fingers in the sausage machine. I lived at 37 Blatchington Road. Looking at it on Google Earth, I have now lived in Australia for many years, I am amazed how little it has changed. Keith Kent my old friend from George St. school. Through this page I regained contact with him, unfortunately as we age and memories linger, Keith has passed away over a year now in Devonport, Tasmania. Does anyone remember going to Wish Road Park to play softball? I remember playing soccer at Wish Road Park, going on the bus with Mr Evans packed three to a seat. But I have a question, did George Street School have lights in the classroom?